No, not the Lincoln-Douglas debates. 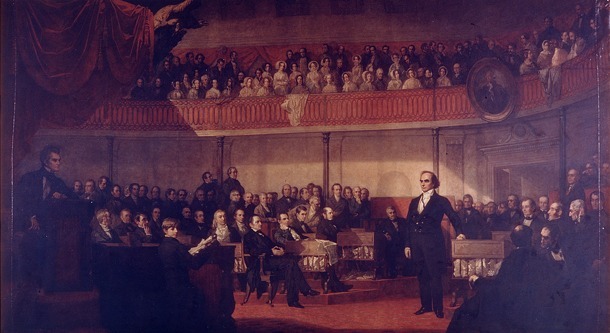 Perhaps even more important than that Illinois contest of 1858 was the Webster-Hayne debate of 1830. Confused? Drawing a blank? Not really your fault. Would you be even more surprised to hear that these were debates held not out in front of voters, but in the Senate? And that debates in the Senate could change public opinion? Build and break coalitions? Redirect political energy? These days when the United States Senate is referred to as “the world’s greatest deliberative body,” it’s to both tell the windup and the punchline of a joke. If anyone regards the Senate as useful for much of anything, it’s to quickly pass legislation originating in the House or swiftly process presidential appointments. The Senate is now simply a hurdle in the legislative race. It was not always so. The curious case of the Senate is that the Senate now means so little. On his now famous journey through the United States, the eternally scribbling Tocqueville noted that the debates of the Senate were worthy of any legislature in the world. Tocqueville’s timing was impeccable. He had arrived in the Senate at the beginning of what is now regarded as the “Golden Age” of the Senate, lasting approximately from 1830 to 1860. One reason often given by political historians for this age of oratory and debate, and Senatorial consequence, was the controversy over slavery that was the focus of this rhetorically elevated contention. But as Christopher Childers demonstrates in his new book about the critical debates that effectively inaugurated this era, the “golden age” of the Senate was the result of political breakdown and upheaval, the end of the previous generation of political culture. That breakdown is the focus of our our conversation today–along with the confrontation of Hayne of South Carolina and Webster of Massachusetts, what happened afterwards, and how it was first remembered and then forgotten.